IN A SPIN: Yorkshire's Adil Rashid is proving one of the top bowlers in the Big Bash. Picture: Mike Egerton/PA. ADIL RASHID’s planned arrival in South Africa prior to England’s one-day series could be delayed if Adelaide Strikers reach the knockout stages of the Big Bash. The Yorkshire leg-spinner – officially the No 1-ranked bowler in the Australian T20 tournament – is due in South Africa on January 23 along with those not involved in the ongoing Test series. Yorkshire first-team coach Jason Gillespie, who doubles up as Strikers coach, has revealed that Adelaide plan to ask England to allow Rashid to stay on should they reach the last four. Gillespie’s side will seal their semi-final spot if they win their penultimate group game at home to Hobart Hurricanes today, with the semi-finals taking place on January 21 and 22 and the final on January 24. The five-match one-day series in South Africa starts on February 3, with a warm-up match against a South African Invitational XI on January 30. “If we make the semi-finals and final, we’ll have to be extra nice to Mr Strauss (Andrew Strauss, the England director of cricket),” said Gillespie. “We’ll have to ask Mr Strauss if Rash can stay on a bit longer. “I think England will certainly be pleased with how Rash is going here in Australia. Rashid’s stint with Strikers is with England’s blessing after they overlooked the 27-year-old for the four-Test series. England face a hectic period of white-ball cricket, with the South African series followed by two T20 internationals against the same opponents and then the T20 World Cup in India in March. There is a growing recognition among the England management that players such as Rashid can only benefit from exposure to competitions like the Big Bash, which more accurately reflect the challenges of international cricket than our own NatWest T20 Blast. Yorkshire’s new signing, David Willey, is another taking part in the Australian event, the left-arm pace bowler having taken eight wickets for table-toppers Perth Scorchers ahead of his own arrival in South Africa, which could also theoretically be delayed. “It’s been a great move for Rash and he’s been the difference for us really,” said Gillespie, whose side have won five of their six games and will definitely top the eight-franchise group if they win their last two fixtures. “He beats the bat on both sides and his variations have been absolute key. “You can tell that opposition batsmen are pretty unsure about how to face him. Gillespie’s knowledge of how to get the best out of Rashid has undoubtedly assisted a man who is the tournament’s second-highest wicket-taker with 12 at 13.41. The former Australia fast bowler knows that the wrist-spinner must be given freedom to express his talent. “Our game plan for Rash could not be more simple,” said Gillespie. “It’s basically, ‘Just go out there and bowl, mate’. Gillespie has helped to create a relaxed and positive environment at Yorkshire and it appears that a similar atmosphere prevails at the Strikers. Few gave them hope of pulling up trees but they have statistically been the best side and no one would fancy facing them in the knockout stages. “It’s been a lot of fun, and that’s really been the cornerstone of what we’ve done so far,” said Gillespie. “We’re just embracing the tournament and enjoying it for what it is. England are not alone in recognising that exposure to competitions like the Big Bash can be helpful. 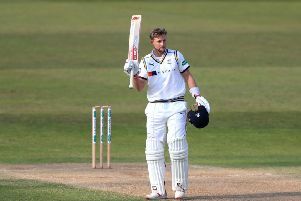 Gillespie’s own presence owes to Yorkshire’s appreciation of the fact he can broaden his coaching experience in a format in which the club are anxious to excel. “It’s been really good for me and I’m learning a lot,” said Gillespie, who has a two-year deal with his home-town franchise.